Home Latest Event Maximum Groovity 8: The Ultimate Interschool Dance Showdown this 2012! 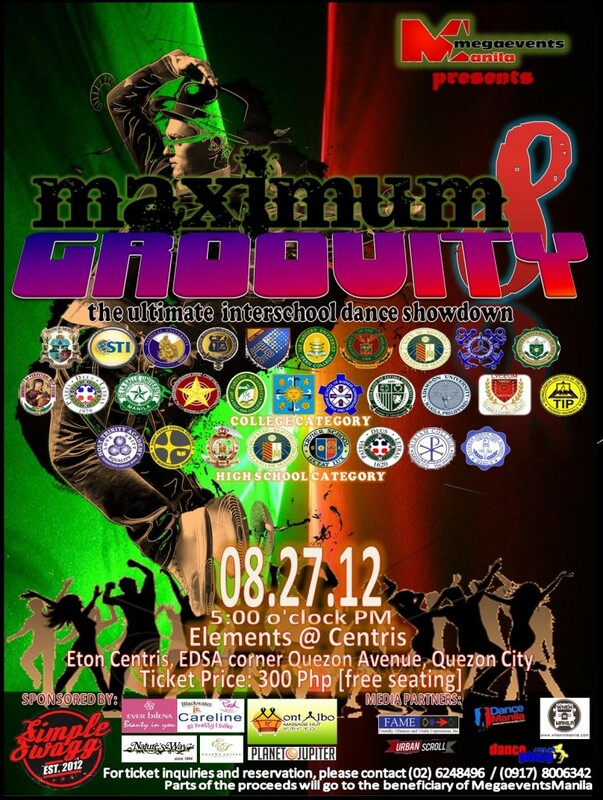 Maximum Groovity 8: The Ultimate Interschool Dance Showdown this 2012! Drums roll, feet stomp to the rhythm, and hearts pound as MegaEvents Manila, brings you the latest installment of the hottest dance craze in town - Maximum Groovity Year 8! Witness as 20 college and 10 high school dance troupes compete for this year's battle. This will be held on August 27, 2012, 5PM in Elements @ Centris at Eton Centris, EDSA corner Quezon Avenue, Quezon City. This year's event will reunite past winners, and new competitors. Wait and see who brings "it" to the floor, and will have the claim as Maximum Groovity 8 Ultimate Grand Champion! For ticket inquiries and reservation, you may contact Aldrid Lucena at 0926-6804500.